I purchased this roller over a year and this was definitely worth the money. My husband & I shares this bag & we have enough room for 3 balls two pairs of shoes & other accessories.This bag has great quality. The bowling bag is great for putting three balls in. I really like the bright colors. I got this bag for christmas because my old bag was falling apart. I love the bag. The color is awesome and there is plenty of room for my shoes and other essentials. The only little problem I have is that the place where you put your bowling balls is a little small. You can fit all 3 bowling balls in the bag but its just a little tight. Other than that, everything is great. I love it!!! This bag is very stylish and has large pockets which can fit my size 14 shoes and plenty of space for other items. It was a little difficult to zip up three bowling balls initially but after a while the bag loosened up some and it was quite easy to zip up after that. I use this product for league. I would not buy for travel to tournaments. Very good investment for what I use it for. I bowl in severals leagues per week and travel to participate in tournaments. The size of the triple pouch is great. Storage is adequate. Would prefer anchored dividers between each ball. Material began to fray within a week on the outer edges of the triple pouch. The straps are not easy to adjust either. The see through side panel ripped along the carry strap,less than one year of use. Cost for repair is greater than the cost of buying a new bag. 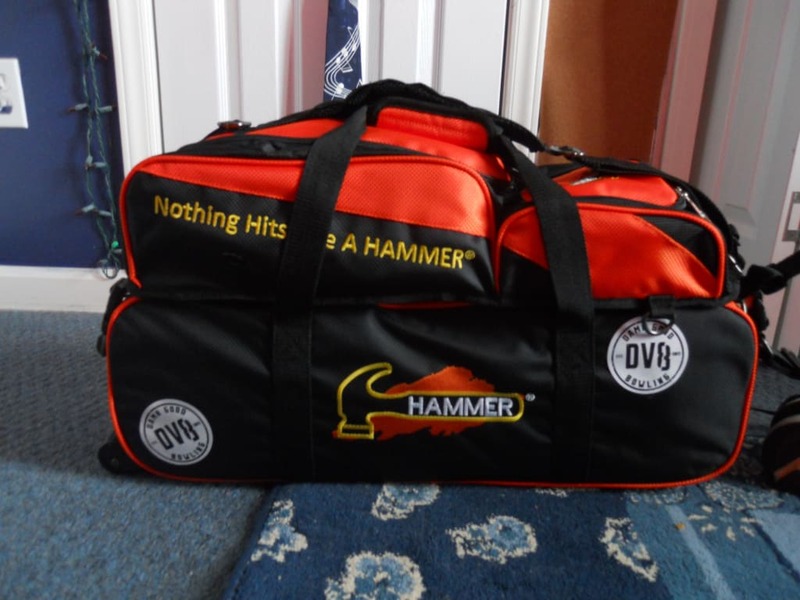 I saw this bag at a ball demo day and really liked the appearance. 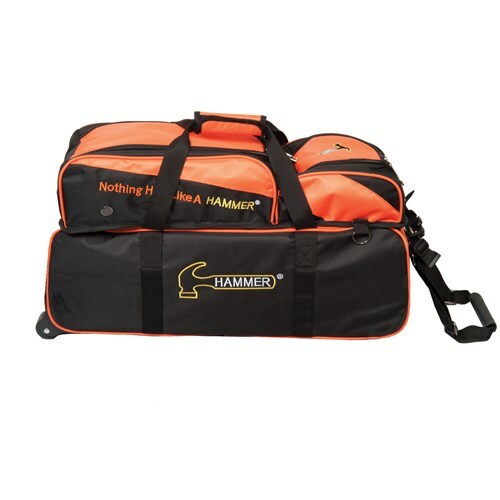 I bought one for my son when he started a sport league and needed a ball bag that would hold his growing collection of bowling balls. The first bag we received was awesome and exactly what I expected. I loved his bag so much I bought one for myself. When my bag arrived I immediately noticed my bag was faded and not nearly as bright orange as my son's bag. I sent the bag back (bowling ball.com was very easy to work with) However, when I received the second bag it was just as faded as the first. (it actually looked like it had been left in the sun for a long time) I decided to keep the bag because it still functioned, it just wasn't as bright orange as I would have hoped. Although I was disappointed with the color of my bag, I still liked it enough to buy another one for my son (since joining his sport league I have bought 3 more bowling balls for my son). The 3rd bag arrived and it was just a dull as my bag, so I just chalked it up to my sons first bag being just a brighter material. I like the color. The bag is lightweight and easy to pick up. The see-through panels makes it easy to see what balls are in the bag. This bag is very stylish and very easy to use. I have a small convertible car with a small trunk. This bag fits in the trunk very well. It a great bag. Great bag! 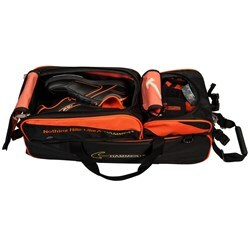 Plenty of room and padding for your bowling balls, the detachable accessory bag is great as well. Fits all my gear and size 14 shoes with space to spare. The only, and I mean only, downside is that it's a bit heavy fully loaded. But that's a given with any 3+ ball bag. That's why it has wheels. Great buy! Side view window failed within 8 months, still waiting for warranty repair or replacement. 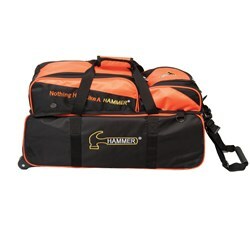 Due to the time it takes to produce the Hammer Triple Tote w/Removable Pouch ball it will ship in immediately. We cannot ship this ball outside the United States.